A ticket redemption game from Andamiro. The machine has a section in the centre where a ball is dropped from the top. A countdown sequence plays beforehand to alert the player that the ball is about to drop. As the ball drops, players must hit the button which triggers a mechanical catcher which catches and moves the ball into one of five possible slots. Each slot is worth a different amount of tickets, including a Big Win slot which features a bonus stage where players can hit the jackpot. Timing is equipped to dispense winning tickets, with operator choice to change numbers to adjust % pay-out. It is also equipped with a steel-reinforced metal cabinet. A ticket redemption game from Andamiro. The machine has a section in the centre where a ball is dropped from the top. A countdown sequence plays beforehand to alert the player that the ball is about to drop. As the ball drops, players must hit the button which triggers a mechanical catcher which catches and moves the ball into one of five possible slots. Each slot is worth a different amount of tickets, including a Big Win slot which features a bonus stage where players can hit the jackpot. 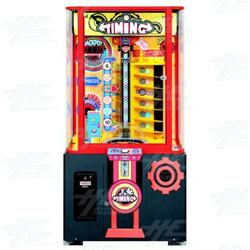 Timing is equipped to dispense winning tickets, with operator choice to change numbers to adjust % pay-out. It is also equipped with a steel-reinforced metal cabinet.